Tens of thousands of Palestinians in the West Bank, Gaza and Lebanon on Thursday marked Nakba Day – or the "catastrophe" of Israel's inception – with rallies that underlined the refugees' desire to return to the homes they were "driven away from in 1948". In Gaza, thousands called for an end to the internal rift between Hamas and Fatah. Three separate Nakba Day rallies organized by Hamas, Islamic Jihad and the PLO were held in the Strip. 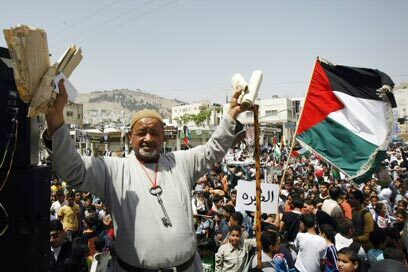 During a rally organized by Fatah in the West Bank city of Nablus, the name of square located between the Balata and Askar refugee camps was renamed "The Return Square", and similar rallies were held in Jenin, Tulkarm and other cities in what was described as a show of the refugees' "desire to return to their homes". All of the speakers stressed that the Palestinian refugees' right of return was undeniable and must be implemented as part of any future agreement. On Wednesday the London-based al-Quds al-Arabi quoted Islamic Jihad Secretary-General Abdullah Ramadan Shallah as saying that Palestinian recognition of Israel would be "more dangerous than the Nakba of 1948." In a speech delivered by telephone for an event in Gaza on Tuesday, Shallah said: "What is more dangerous than the Palestinian people's Nakba is that the ones with the rights recognize their enemies and deny their own rights. Everything that is happening in Jerusalem is the result of the deals, agreements and negotiations with the Zionist enemy." The Islamic Jihad leader also directed implicit criticism at Jordan's King Abdullah, who has been reported to be engaged in efforts to soften the Arab peace initiative, thereby making it easier for Israel to accept it. "We mark the Nakba while we fear an American-Zionist and Arab offensive, and that the Islamic world will open its doors to the Zionist entity," he said. Referring to an interview submitted to by "one of the Arab rulers, who said the future is not in the Jordan River or Golan Heights," Shallah said: "This is the prize given by the Arab ruler to Israel." Meanwhile, the Palestinian Authority is threatening to take legal action against Israel's decision to appropriate some 11 acres in east Jerusalem, in the Silwan area. Senior Fatah official Hatem Abdel Kader, who serves as Palestinian Prime Minister Salam Fayyad's advisor on Jerusalem affairs, demanded that Israel explain its decision within a week or it will seek the intervention of international bodies. 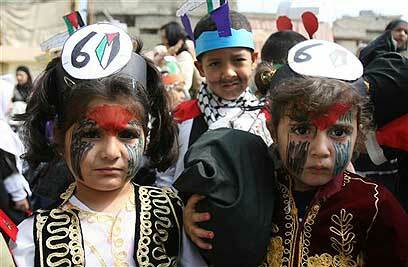 See all talkbacks "Thousands of Palestinians mark Nakba Day: We want to return to our homes"